Does that sound familiar to you? I’m sure I’m not the only one who had parents who said similar words to them. I’m definitely not alone in remembering how I would roll my eyes or groan on the inside every time they would say it. Yet, here I am, now completely understanding what they meant. What do you know, our parents were right. Now I know how you can love your child so much and do anything and everything in your power to protect them, even to the point of sacrificing yourself. Now I understand why my mother would would wait up for me till the wee hours of the morning to make sure I got home okay. Now I understand why my mom would get mad at me when I got hurt. Now it all makes sense. As a parent of two little ones, I find myself thinking more about what my mom and dad used to tell me and how maybe I should have listened more or just gave a little more respect to some of the things they said that I may have scoffed at. But I was a kid, then I was a teenager and teenagers know everything right? I guess that’s how it’s going to be with our children as well. So that begs the question, now that we know and have the hindsight, what are we going to do about it? Are we going to be doing the same thing to our kids? Are we going to be saying the same things knowing that they won’t care and will totally ignore what we say? Is it worth it doing it knowing that 20 or 30 years down the road, they’ll understand that we were right? Maybe it’s not even a choice. Maybe when you become a parent, it’s just in you to say that to your kids. All we can do now is apologize to our parents (which I did) and wait for that time in the faraway future when you have grandchildren and your grown up children come to you with that look. You’ll listen, you’ll shake your head and on the inside you’ll be saying, I told you so, just like our parents did. What is something that your parents used to say to you that you didn’t like and now you find yourself saying it to your kids? You know, I don’t remember hearing my parents say that to me. I can’t think of my saying to my kids either, but I might have. Thank for your comment Jenn. I guess all families are different in what they say to their children. I can totally relate to this post Salma! I guess it could be also a cultural thing too. My mom said that all the time to me when I was young (teenage). Believe it or not I did too apologized to my mom and dad after I had my son. Becoming a mother truly makes you understand your own parents in a whole new level. I always had respect for my parents but I know their true value after I had kids. It could definitely be a cultural thing Roya. I guess I’m not the only one felt that way after having kids, it really does change your perspective an understanding of things. My parents never said that to me, but I have had countless moments when I wanted to go back and apologize to them! You are not alone Tarana! Mine would be “it’s for your own good.” Lol! Yes, unfortunately we can’t Esha. At least you know you are not alone in this. Totally! My parents always said this. And now they say, “Now you understand!! 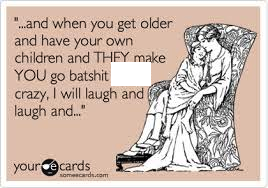 !” I actually have to admit I caught myself saying this to my son a few days ago! Lol!